Heading south from Ditmas to 18th Avenue. Auto repair shops & wholesalers, Train World: "The Closeout Kings - Family Owned & Operated Since 1968." Train World - along with the obsessive male customers who lurk in such a place - seems the perfect kind of business for this under the tracks land. 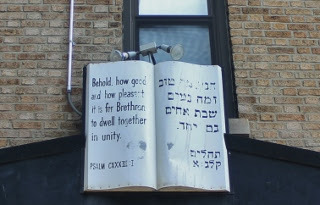 A little further down, the Congregation Chevra Gemiluth Chessed (closed), missing a few letters of its name, displays Psalm 133: "Behold, how good & pleasant it is for Brethren to dwell together in unity." Around here, the faded and hermetic state of many businesses makes it hard to tell whether they are actually closed down, or whether appearing to be open is entirely arbitrary. Across McDonald the tiny signs & pulled shutters of the bookbinder ("fine leather books") give nothing away.